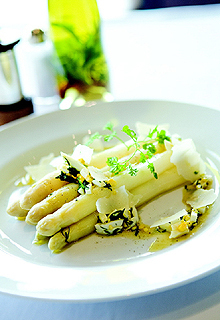 Grand Hyatt's authentic European restaurant, The Paris Grill, is celebrating the arrival of spring with a selection of dishes featuring White Asparagus, the cherished vegetable of royalty. Nurtured by the crowns of Europe for centuries, this noble vegetable of kings with its unique, delicate flavour and texture is the quintessential "luxury" vegetable. The White Asparagus is less bitter, with a milder taste than its green counterpart. The Paris Grill offers you a wide range of asparagus delicacies to enjoy, including White Asparagus with Black Angus Beef, Smoked Salmon, Foie Gras, Roast Lamb and more, either a la carte or as a set menu, prepared in a variety of savoury presentations. A la carte menus range from KRW 18,000 ~ KRW 39,000 and two different set menus are offered at KRW 82,000 and KRW 99,000 each, exclusive of tax and service charge.